-- Select a Size -- 8 - 14" Chest - Out of Stock! 14 - 20" Chest - Out of Stock! 20 - 28" Chest 28 - 34" Chest - Out of Stock! 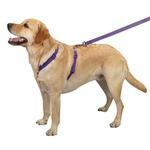 Control your "puller" better on a leash with our Zack & Zoey Nylon Dog Harnesses in Ultra Violet. Durable nylon construction with dyed-to-match stitching. Fully adjustable to fit many sizes. Nickel-plated D-ring on back for leash attachment. This basic Nylon Harness by Zack & Zoey provides simple style with the durability to control energetic dogs on leash. Harnesses distribute pulling power over your pup's body, which lessens the chances that they will have neck injuries. Additionally, having multiple straps holding your pet decreases the likelihood that they will be able to escape. This Ultra Violet harness is strong nylon with reinforced stitching to provide assurance that your pup will be well contained. The adjustment clips match the straps to provide a seamless look. The light purple color is a nice choice for Easter, spring, summer or any time of year. 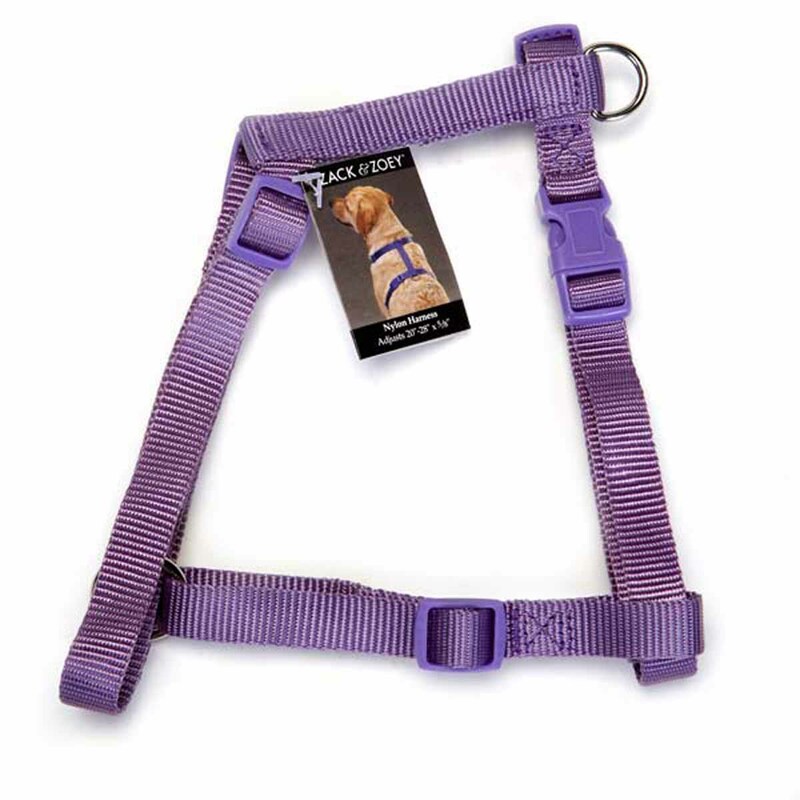 This Ultra Violet Nylon Harness is everything you need in a good dog harness. It's perfect for all sizes of dogs with its many points of adjustability and comes in multiple colors! The small-sized style may also be appropriate for use as a cat harness. Nylon Dog Harness by Zack & Zoey - Ultra Violet Customer Photos - Send us your photo! Rico and his 2 brothers are always styling with Baxter Boo. I like the look of it but the plastic buckle is difficult to open. I don't think it will be used often as pups don't like to wait long while I can't attach a harness quickly. Ok - so I have to say since I have horses and I know the quality of a halter or harness I was somewhat disappointed with this harness. I first noticed that it didn't have the heaviness/thickness of other brand harnesses. And the little plastic bands that hold the material together after you get the sizing correct isn't there. So the material is loose and not snug together. My puppy was able to maneuver her mouth to chew on the front of the chest strap because it opens up if she lays in a certain position. I wish the designer would have looked at other harnesses to see how theirs are made. The little things like those plastics band really do make a difference. Posted On 04/17/17 by Emme Hill from Pittsburgh, PA Yes, Emme Hill recommends this product! First off love the color. And my dog looks absolutely too cute in it. She is black and white so the purple adds a nice pop. It does take a little longer than expected to put on but my little girl is a puller so this harness is worth the extra 15 to 20 seconds to put it on so she doesn't pull me. I had wrist surgery in february so I have to be warry of things like pulling etc so this harness does so much to help that. Posted On 01/04/17 by sarah f from , MA Yes, sarah f recommends this product! Posted On 10/16/16 by Cherri M from , MI Yes, Cherri M recommends this product! The color is nice. This is a very average harness and would work best with a dog that walks nicely. I would want a more sturdy harness for training a pup or walking a puller. Posted On 03/22/16 by Gus from los angeles, CA Yes, Gus recommends this product! Posted On 01/19/16 by Ashley T from , Yes, Ashley T recommends this product! It really works well by keeping my dog on track, and it doesn't hurt her neck! Posted On 01/01/15 by Cora M from Concord, CA Yes, Cora M recommends this product! Great color! Bought different colors so my little guy will be the best dressed! Always a fun shopping experience! Thank you!